High Quality Professional Record Cleaning service giving the best possible clean in a carefully controlled environment. Our specialist cleaning process often noticeably improves sound quality - even compared to any other cleaning method or machine. To have records professionally cleaned using the on-line service just go to the Pro-Clean link below. We use our own custom designed equipment employing ultrasonic cleaning and brushes with a specially developed forced air system. Unlike many other cleaning systems, any residual dirt and fluid in the grooves is completely removed, so your stylus tip won't get clogged up on the first play after cleaning. Finally the records receive more antistatic treatment, before being placed in a new antistatic inner sleeve. Our Pro-Clean 'alcohol and solvent free' method is suitable for all records except 16" vinyl and shellac 78's. 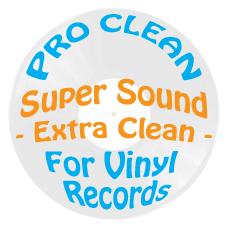 Professional Ultrasonic Vinyl Record Cleaning Service7" 10" & 12" vinyl records - same or m..